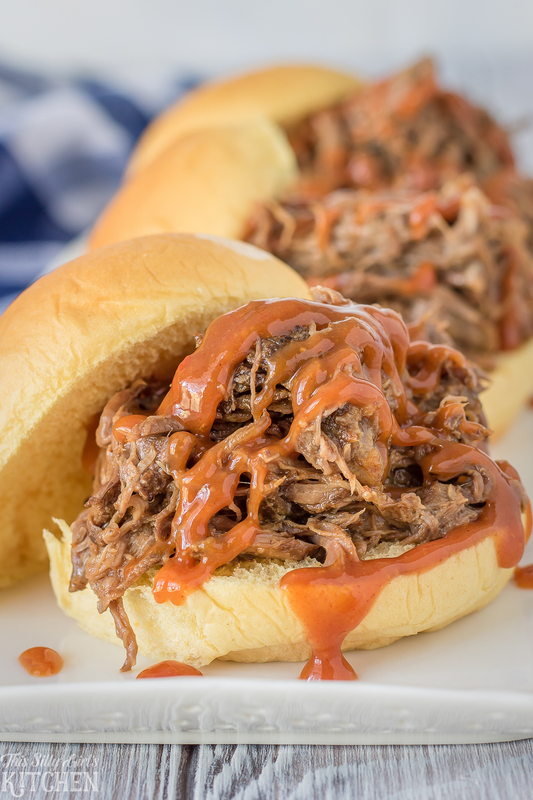 Slow Cooker BBQ Beef Sliders, five-ingredient BBQ Beef (S&P included!!) 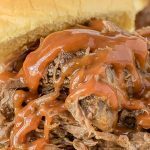 slow cooked for hours and topped with your favorite BBQ sauce! 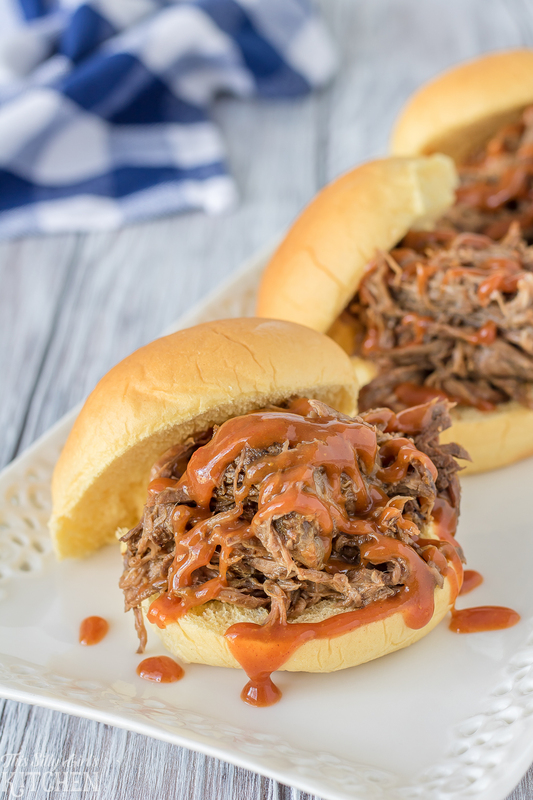 Slow Cooker BBQ Beef Sliders are a staple sandwich you and your family will love year round! Although, there is just something super comforting about these sandwiches during the fall and winter months. Plus, they are perfect football food! Or any sport food… or weeknight meal… who am I kidding?! Jeremy and I LOVE bar-be-que. We go searching on the weekends looking for new spots. We are obsessed. We have accepted this. Thank you for understanding. I love that now I can make some of our favorite sandwiches right at home any day of the week. 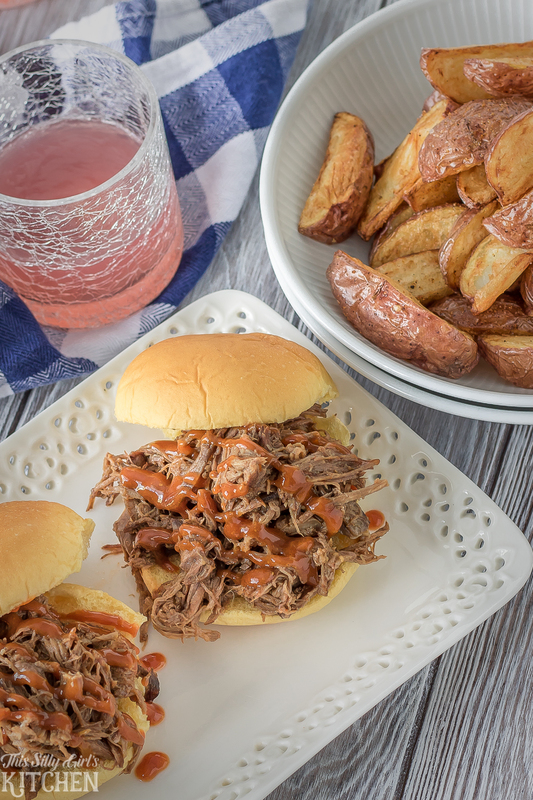 These bbq sandwiches are made from a super inexpensive cut of beef – chuck roast. This also makes a ton of beef, so depending on the size of your family, you will most likely get multiple dinners out of one chuck roast. I served up some fried red potato wedges with these, piled the beef high on slider buns with more bbq sauce and called it a day. 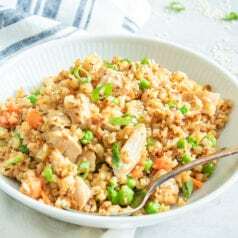 There is basically no effort in this recipe, it is delicious, and it makes a LOT. Win-win-win. From this batch of bbq beef I also made bbq nachos (recipe to come soon!)…. yeah, I went there. Trim chuck roast from excess fat, cut into large chunks. Generously season with salt and pepper. Sear beef on all sides in a large pan. Deglaze pan with beef stock. Place seared beef and beef stock into slow cooker. Cook 4-6 hours until super tender. Shred. Add favorite bbq sauce and mix. Serve on slider buns. Top with more bbq sauce, and done. Cutting board, I like these non-skid ones. Large saute pan, for browning meats to making sauces and everyday meals. Slow cooker, highly recommend every home cook get one of these! This is a super basic recipe. These sliders are just begging for a wide variety of toppings like cheese sauce, fried onion strings, or even sliced avocado! You really can’t get much easier than this recipe. There are only five ingredients. What is your favorite bbq restaurant?! 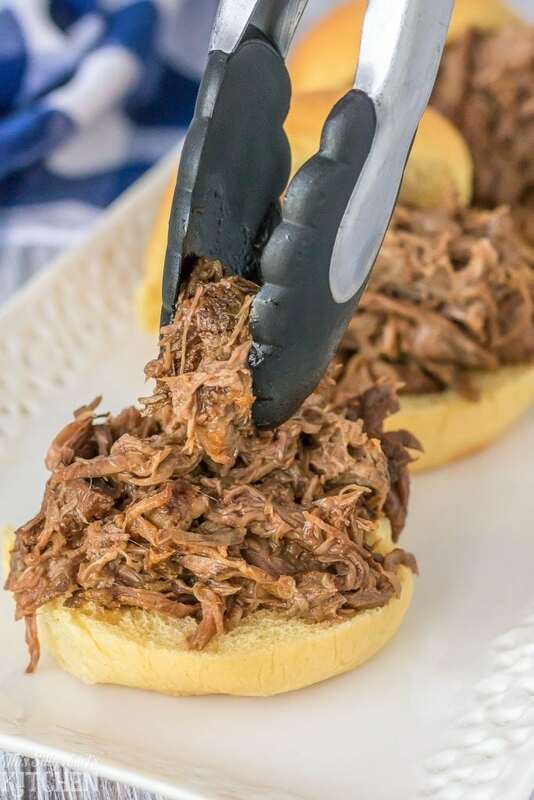 What is your favorite slow cooker recipe using chuck roast? I’d love to hear about both in the comment section below! Season beef on all sides with salt and pepper. 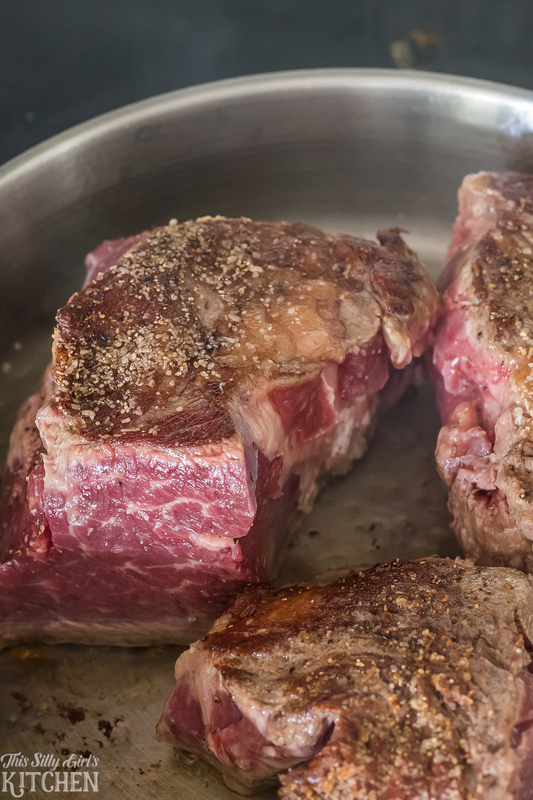 Add olive oil in a large pan over medium-high heat and sear beef on all sides until deep golden brown. Take beef out and place in a slow cooker. Deglaze pan on the stove with the beef stock, scraping the bottom of the pan to remove all the yummy bits. Pour everything over the beef in the slow cooker. Cook on high for 2-4 hours or low 4-6 hours or until beef is so tender it shreds. Drain liquid and set aside. Take out beef onto a plate. 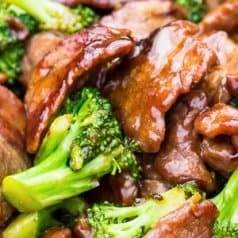 Shred beef, removing any excess fat. Place beef back into the slow cooker on the warm setting. Add about 1/2 cup of the stock back to the cooker. Add the bbq sauce and stir to combine. Serve on slider buns with more bbq sauce if desired. There are few things more satisfying than digging into juicy, saucy BBQ beef sliders. You’re making me hangry! 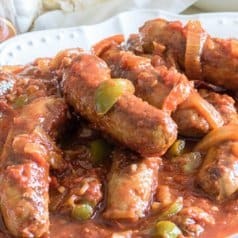 We’ve been looking for more slow cooker recipes, yum!! !